Flipping houses continues to grow in popularity as the real estate market remains strong and cable TV shows follow house flippers making huge profits from purchasing, rehabbing and selling flipped houses. While flipping homes is usually made to look fairly easy on TV (with the exception of a few hiccups here and there for dramatic effect) there are numerous pitfalls which can eat up the real estate investor’s profit quickly and even lead to large losses. Flipping homes in California is an increasingly competitive industry. The increased competition drives up the property purchase price which reduces margin and makes any mistake that much more costly. Before even placing an offer on a house to flip, the real estate investor must research the local market and determine a conservative after repair value (ARV) of the flipped house. The two most important numbers that determine the success of the house flipping project are the purchase price of the house and the sales price of the house. The lower the purchase price and the higher the sales price, the more potential for profit exists and the more likely that any unforeseen issues that arise during the project will not end up causing the project to result in an overall loss. Never assume that potential buyers in the area will be in love with the final product and willing to pay a premium over market value. If anything, the flipped home should be listed slightly below market value to increase interest in the property and allow for a quick sale. Staying on the market longer and waiting to sell the flipped house for top dollar will likely decrease the overall profit of the project as holding costs (fix and flip loan payments, taxes, insurance, HOA, etc.) continue to accrue on a daily basis. While the current real estate market may be appreciating, a lot can change in the 3-9 months it takes to flip a house. Making decisions based on conservative estimates is the reasonable thing to do. Not knowing your numbers when real estate flipping is a recipe for disaster. Not accounting for a major expense could take the project from the black to the red very quickly. Make sure to be very thorough and conservative when determining all the necessary costs of the house flipping project. 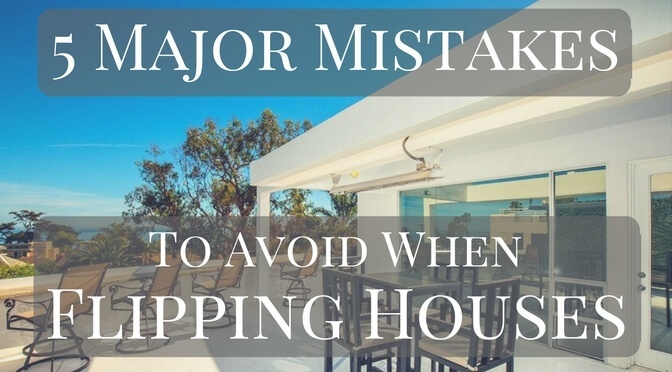 There will always be problems and expenses that couldn’t have been planned for when flipping houses. Corroded pipes that need to be replaced, cracked foundations, electrical work that must be rewired, mold, and previously unpermitted work. The list of potential hidden (and expensive) problems can go on and on. After determining all of the costs associated with flipping the house, make sure to have a contingency fund of another 20-25% in cash available for these potential unforeseen issues. Running out of cash during a project is a terrible position to be in. It may lead to bringing in a partner and giving up profit, or having to sell the property before being completed to another investor for a big loss. In some cases real estate investors must take out a hard money 2nd against a property in order to raise funds to finish the project. 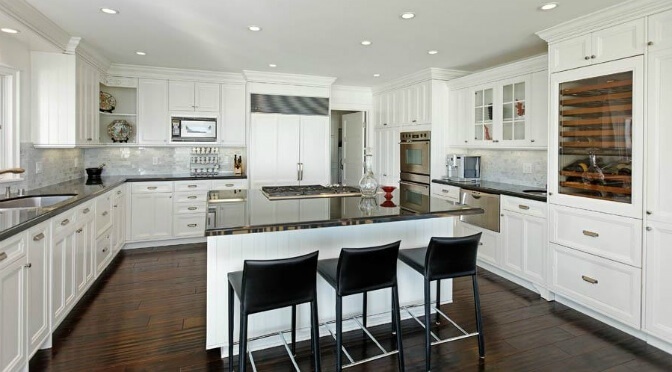 Quartz countertops and real hardwood floors might look great in the flipped home, but if these premium features don’t exist in many other homes in the neighborhood, buyers aren’t likely to pay a premium for them. This will result in extra costs with little to no return. When planning the rehab of the property, be sure to research the local market and determine which types of features are expected by buyers in the area and what features are not. Tour a few open houses in the immediate area and speak to real estate agents about what specific features are expected and in demand. It’s important to work with an experienced general contractor who can handle every aspect (or subcontract) of the rehab process. Unless the real estate investor is also a general contractor, it is best to put an expert in charge of the construction process. A real estate investor inexperienced in construction may be able to help with some tasks such as demo or painting, but trying to learn how to lay tile while flipping a house is a bad idea when time is tight and costly redo’s aren’t in the budget. Home inspectors, real estate agents and home buyers with a good eye can spot subpar work. Paying to have the work completed correctly the first time is much less expensive than paying to have work redone. When flipping houses, it is best to complete the project and sell the property as soon as possible. This not only reduces the holding costs but also reduces the risk of the real estate market declining and decreasing the property’s ARV (after repair value). Don’t assume the contractor will be able to meet their estimated timeline for the completion of work. Flipping houses is rarely a straightforward endeavor. Problems are bound to come up which will result in delays and setbacks. Schedule at least an extra month or two into the overall timeline depending on the overall scope of the project. North Coast Financial is a California direct hard money lender based in Southern California (San Diego) providing financing to real estate investors who are flipping houses in California. North Coast Financial provides fix and flip financing throughout California including Los Angeles, Orange County, San Diego, San Francisco Bay Area, Riverside, San Bernardino, Sacramento, Central California, Ventura and various other areas in California. Please see our Fix and Flip Loans / Rehab Loans page for additional information.